In the 19th Century many people, especially those living in the country or rural settings, made their own cider, beer or wine. Some even distilled their own hard spirits. The first appearance of hops in French Prairie, then, would most certainly have been due to individuals growing it for beer making or other uses – such as tea and as a medicinal. A story still circulates in St. Paul that hops were first brought to Oregon by the Sisters of Notre Dame de Namur, who arrived in Oregon in 1844 from Antwerp, Belgium. They established their first school in St. Paul, and operated it until all departed for San Jose, California in 1852. Belgium is premier beer country, so it would be no surprise if they brought hops with them. Commercial production as an agricultural product would have to wait for the advent of commercial breweries. The first hops grown on the Pacific Coast were grown in Oregon, the census for 1850 showing that eight pounds were produced in 1849. Probably almost every farmhouse had one or more hop vines weaving over the back porch, for the hop has enjoyed a long history as a medicinal plant. The Greeks used it for salads, and from early time it has been thought to “free the blood of all impurities, tumor, and flatulence.” It was also considered both a cure for the itch and other disorders of the skin, and a relief for ills of the liver and spleen. However, since the census of 1850 lists only one brewer living in Oregon Territory, it is likely that the “eight pounds of hops” mentioned in the census for that year found their way into bread. Every pioneer housewife had a crock or bowl of yeast for bread making, but if her supply of yeast were lost, she could always start more by steeping hops for several hours, straining the resulting product to form a batter, and then by borrowing a “starter” from some neighbor, once again have the necessary yeast. To make the light bread baked in Dutch ovens a bag of hops was kept in nearly every kitchen. The origin of commercial hop growing in Oregon is still being debated. 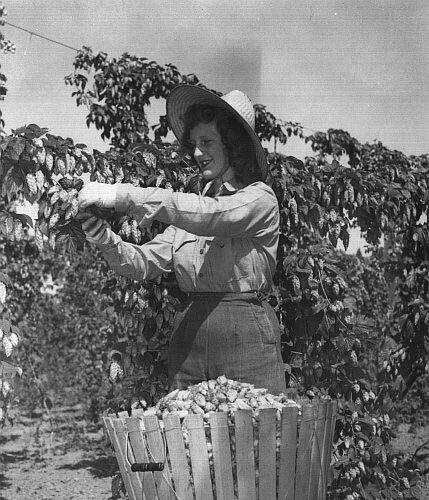 Virginia Eastlick in her book The Oregon Geers credits Frederick Walcott Geer for bringing hop seeds with him to Oregon in 1846, but other sources commonly credit the earliest hop yard as planted in 1867 at Buena Vista (southwest of Salem) by William Wells. 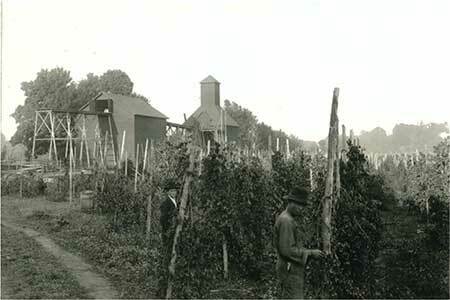 Either way, early hop farming was a small on-farm affair until the appearance of commercial breweries. 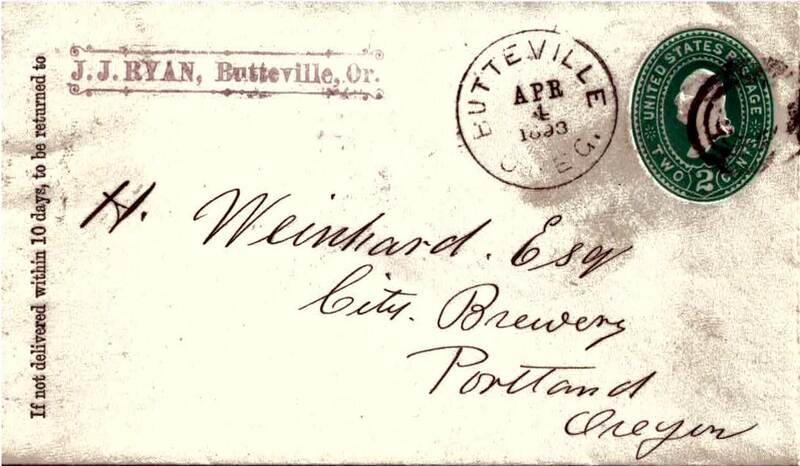 The first commercial brewery appears to have been Liberty Brewery in Portland, opened in 1852 by Henry Saxer, an immigrant from Germany. Saxer’s brewery was followed in 1855 by the arrival of Henry Weinhard who opened his own brewery in partnership with George Bottler. Within a few years Weinhard bought out his partner and Saxer and had a local monopoly! Early production was about 2,000 barrels per year, which grew to over 40,000 barrels by 1875 – necessitating a good supply of barley and high quality hops. One Oregon “urban myth” is that Weinhard paid wheat farmers in French Prairie to convert from wheat to hops so he didn’t have to import from Germany. That origin story isn’t documented anywhere, but we know that within a few years Weinhard was buying hops from French Prairie. Hops grew well in French Prairie because it is on the same latitude as Belgium and Germany’s hop growing regions, but has a milder climate in the form of more rain and less freezing (and no snow) in the winter. Additionally, the dry summer provides great advantage in terms of pest, fungus and mildew control. An envelope confirming correspondence, perhaps a bill (??) sent by JJ Ryan to Weinhard in April of 1893 further dates the transactions between the two. 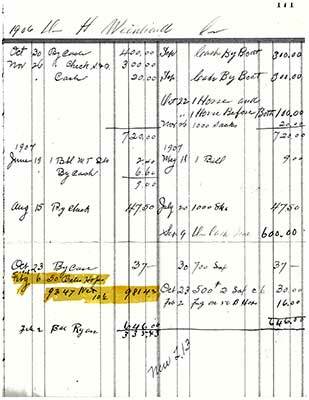 A ledger listing from the Butteville store on Feb. 6, 1906 documents the sale of hops to Weinhard. Above: Letter to H. Weinhard Esq. from J.J. Ryan dated April 4, 1893. 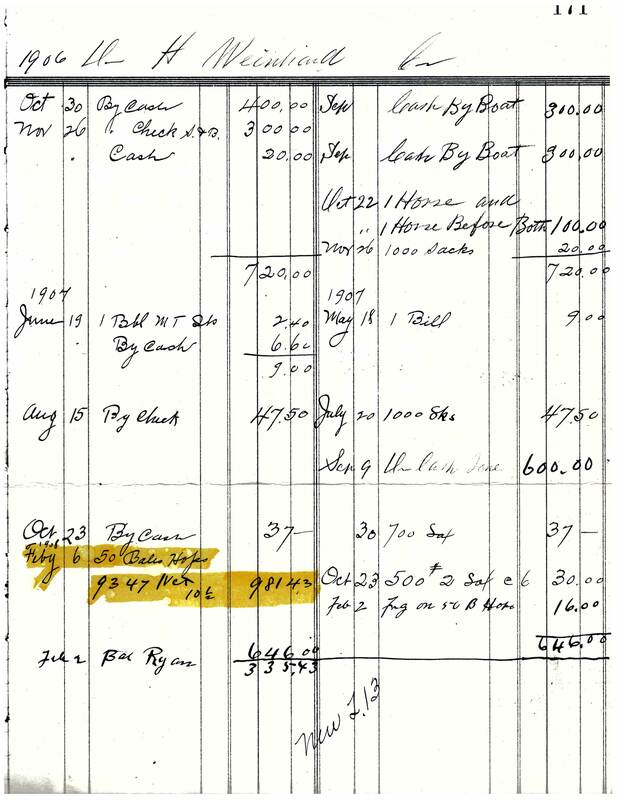 At right: JJ Ryan Store ledger page documenting the sale of 50 bales (approximately 10,000 pounds) of hops to Henry Weinhard on Feb. 6, 1906. Sell price was ten and a half cents per pound for a total sales of $981.43. It’s clear to see that by the 1870’s there was a large demand for hops, and that only kept growing until the arrival of Prohibition. In the late 1800’s and into the early 20th Century, Oregon was considered the largest producer of hops in the US, and by many, to have the finest quality due to much more favorable weather than many other states – like New York where America’s first commercial production began. 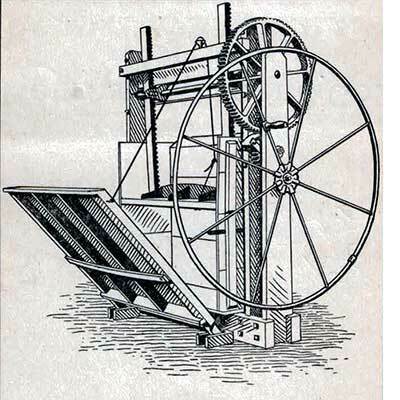 Hop growers not only had hop yards – fields with trellises that the hop vines grew upon – but they also had to have hop houses (dryers) to dry the cones (flowers) after harvesting. Much of French Prairie around Butteville would have contained images like this: farms comprised of hop yards alongside other crops, with at least one to a few hop houses to process, dry press and bale the hops. The biggest risk for all hop growers was fire due to the high content of volatile oils. The fire risk during drying (which used heat from open flame) was such that most hop houses burned down at some point. The need for insurance for this “most hazardous of risks” was great. By the late 1880’s fire insurance in the Willamette Valley was very expensive. 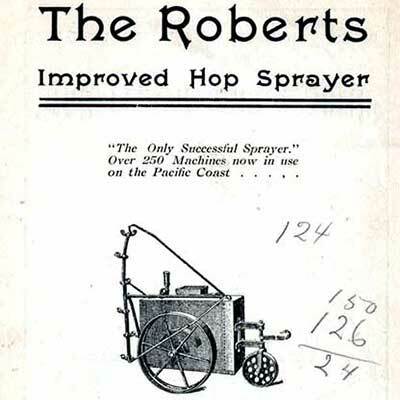 We know this from the formation of The Hop Growers Fire Relief Association in 1890, which was organized to provide “safe protection against fire at a reasonable cost.” It was set up as a member-based co-operative organization that was initially limited to the area around Butteville, but by 1904 offered coverage across the entire Willamette Valley. The introduction to the Hop Growers Handbook describes the need for the organization, and summarizes performance since its founding In 1890. The first year of operation, we can calculate that less than 70 policies were in force. By 1895, that number had risen to 390 policies, and by 1904 was 1,004 policies covering $926,839 in property at risk. 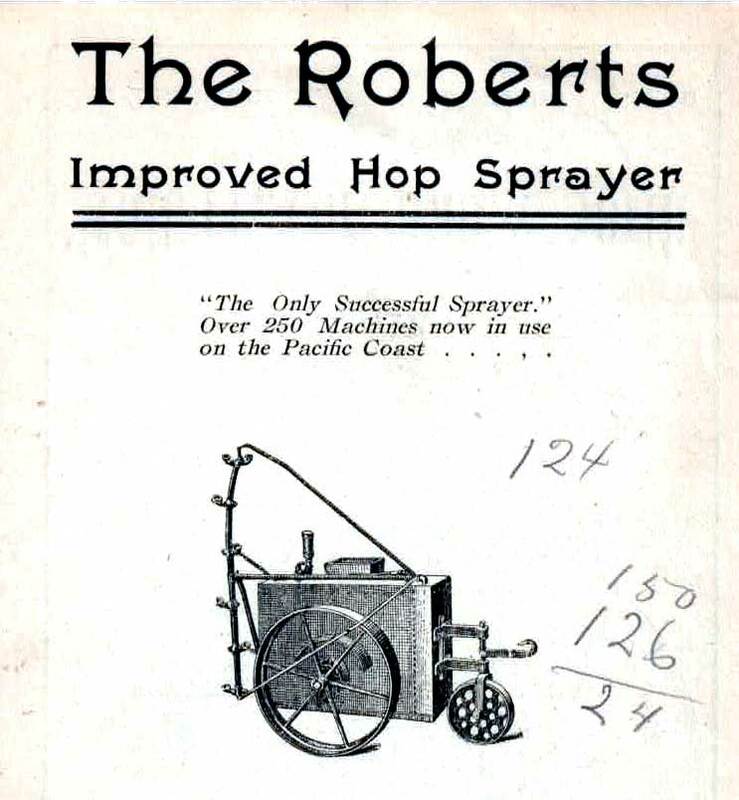 The Hop Growers Fire Relief Association operated in a prudent and conservative manner, guided by Directors W.R. McKay, C.F. 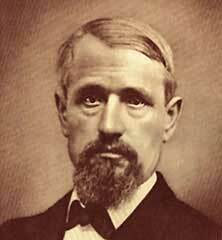 Barrett, W.F. Young, John Murray, and T.C. Ackerson. John Murray was President, Henry L. Bents Secretary, and W.E. Iler was Treasurer. Besides being cautious in the fire insurance they extended, they also promoted safeguards (including hop kiln design) and urged caution during drying time, that presumably included member education. The Hop Growers Fire Relief Association considered hops among “the leading agricultural industries” of the Willamette Valley. It competed with wheat, the first commercial agricultural crop in French Prairie. The Association documents that in 1903 Oregon produced about 90,000 bales of about 200 pounds each (18M pounds). In 1904 production was projected to be 16M pounds with a crop value of $3.5M. These figures correlate with the US Dept. of Agriculture data for 1905 which show Oregon hop production at 13M pounds. 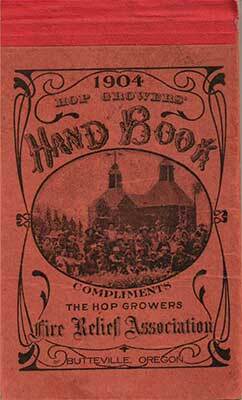 1904 Hop Growers Handbook, produced by The Hop Growers Fire Relief Association, Butteville. 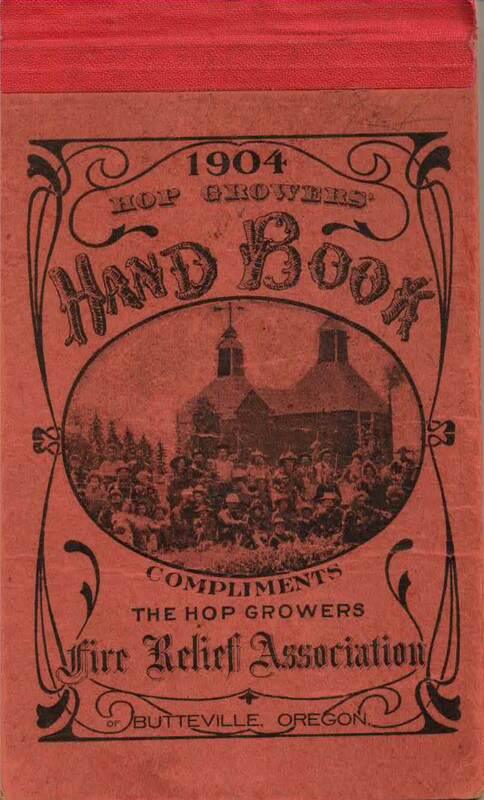 See selected interior pages of the 1904 Hop Growers Handbook by clicking here. 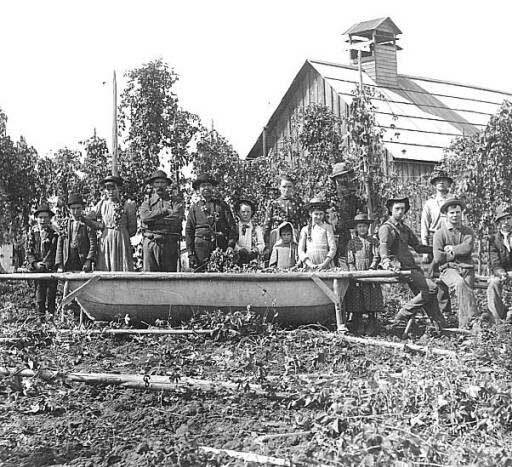 Hand-picking hops in the Willamette Valley, circa 1900. Besides the total crop value, hop production was responsible for employing 36,000 men, women and children seasonally to pick hops and contributed$1M to the state labor economy in 1905. This was hard manual labor, and often involved the entire family: men, women and children. Hops were harvested by pickers into baskets, collected in the filed in large totes, then hauled to the hop drying house for cleaning. After the cones were dried they were pressed into bales of approximately 200 pounds. 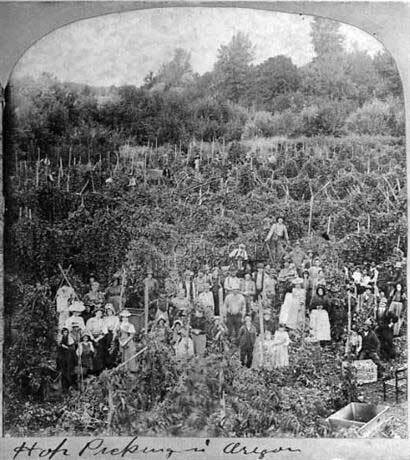 Hop pickers in the Willamette Valley, circa 1890. 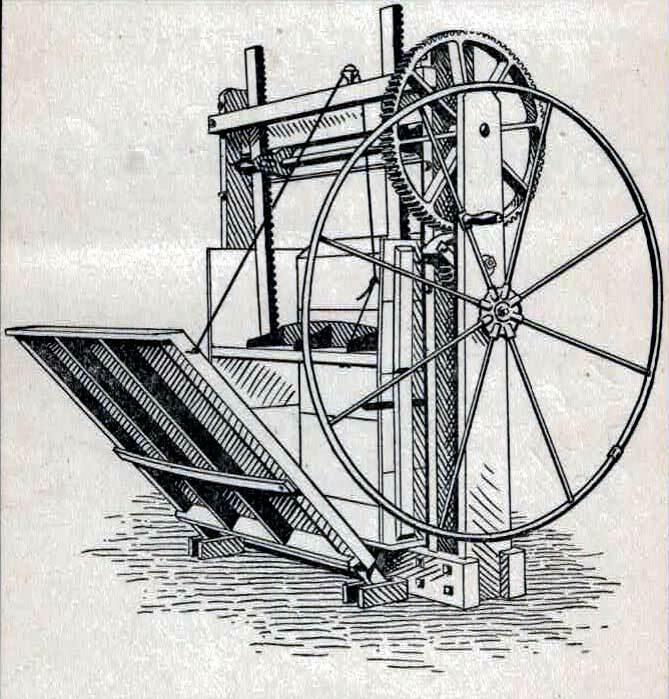 The Hop Growers Handbook contained advertising in the back, including the following hop producing equipment. Hop production in Oregon peaked in the period of 1905 to 1910, and then plummeted with the arrival of prohibition in 1920. Prohibition lasted until 1933, and resulted in most breweries closing or converting to soft drinks. Hop farming now became exclusively an export market, and while the market continued it was significantly smaller. Even after the repeal of Prohibition, the hop market didn’t rebound because the majority of American beer was manufactured by large breweries who not only cut barley with rice, but also used far less hops to produce a milder beer flavor. Hop production took off again in Oregon and other states with the arrival of craft brewing in the 1970’s and ‘80’s and then the explosion of micro-breweries, which use more hops in brewing than conventional brewers, and demand a variety of hop types to create different flavor profiles and styles of beer.